Now here‘s an interesting idea. More than 200 people turned out Thursday to voice their concerns over the proposed track of the High-Speed Rail (HSR) train that would take travelers from Houston to Dallas in 90 minutes. As of now, one of the two proposed routes cut through the heart of the city near Memorial Park. “Our neighborhoods would be further separated by this massive infrastructure that is necessary to put in to track a high speed rail system,” said Super Neighborhood 22 President Tom Dornbusch. Opponents of the plan even offered an alternative route, suggesting that the tracks stop at the Northwest Transit Center outside the loop. There are some big advantages to taking this approach instead of running the high speed rail line all the way into downtown. First, it turns one group of opponents into supporters. As this route runs west of Montgomery County it avoids that county’s demands, though that may trade one set of problems for another. The presence of the Uptown BRT line means that this station would be transit-connected to more than one business district; a downtown station would not be connected to the Galleria area unless the Universities line gets built. The presumably lesser right-of-way needs for light rail should make its construction less expensive than HSR would be along the same route. How it gets constructed, and who pays for it is where things get complicated. An Inner Katy line more or less along this same corridor was on the 2003 Metro referendum, but it’s never been actively pursued and as things stand right now Metro would not have the resources to do it on their own. This corridor is also a possible route for a commuter rail line, meaning that there are three entities with a stake here – Texas Central HSR, Metro, and the Gulf Coast Rail District. There’s also a Super Neighborhood 22-produced Transportation Master Plan that gives possible design specs, though it’s now four years old and might need some updating. If the stars align, this could work very well and provide a lot of benefit. The question is whether Texas Central would be willing to finance, in part or in whole, something that wouldn’t be theirs but which would make what they’re building more valuable. I’d like to think there’s a way to make this work, and I hope there will at least be some discussion about it. If Texas Central prefers a different route that would make this moot, but if they do prefer this route then I hope this possibility will be on the table. I like it a lot, that’s for sure. Some people who live not far from me are not very happy about the high speed rail line possibly running through their neighborhood. The prospect of a high-speed train crossing through First Ward into downtown Houston has residents scrambling to weigh in on the proposal. “I’m completely opposed to this project. I believe we can work collaboratively, but I don’t think the infrastructure of our neighborhood should be destroyed,” says Alexandra Orzeck, whose home is next to existing rail right-of-way eyed as a potential route for Texas Central Railway’s “bullet train” between Houston and Dallas. Property she owns in Rice Military also could be impacted. Many of her neighbors agreed during a recent meeting to discuss the project with TCR President Robert Eckels, who is a former Harris County judge and state legislator, and David Hagy, the company’s community outreach director. Ideally, the train would enter Houston’s central business district and connect riders with other local transit, maybe even other high-speed routes. But the train route might end elsewhere, like on Loop 610 or even further out on Beltway 8, Eckels said. A draft environmental impact statement being devised now by the Federal Railroad Administration and Texas Department of Transportation will factor into those decisions. Local neighborhoods are particularly concerned since the rail company would have eminent domain authority to acquire property needed to build the high-speed rail. Over the past decade, First Ward has enjoyed a residential and artistic renaissance. New, multistory townhomes continue to wedge their way into the neighborhood, which has a recently designated historic district. The well-known Winter Street and Silver Street artist studios helped establish a state Cultural Arts District here. More studios are coming soon. Stakeholders say one of two preferred routes for the TCR project could bisect the Washington Avenue corridor on existing rail lines, either on Winter Street or Girard, where rail right of way is squeezed to 50 feet in some place. TCR has said it needs 80 feet. Local leaders hesitate to support the other preferred route, too, because it impacts Near Northside neighborhoods. TCR should continue to investigate a third route that follows the Hardy corridor into downtown, they said. Similar concerns are expressed in this Leader News story. A route along the Hardy corridor would make a Woodlands station feasible, so the folks here will have at least one set of allies in that quest. As we’ve discussed before, these are the same issues that will have to be dealt with if a commuter rail line moves forward as well. Of course, commuter trains don’t move at 200 MPH, so there’s that. At the very least, you’d want to review the Super Neighborhood 22 transportation master plan from 2010 that called for putting the existing freight rail tracks in that corridor into a trench to avoid at grade street crossings. It should be noted that Tom Dornbusch, one of the architects of that study, doesn’t think trenching would be sufficient to accommodate the high speed line; among other things, the corridor is too narrow, by Texas Central Railway’s own design specs. Eckels mentions other possible locations for the line’s terminal, but putting it downtown really needs to be the goal. Just from a connectivity perspective, it makes the most sense. If that makes a Woodlands-friendly I-45/Hardy Toll Road approach the best option, then so be it. Someone will need to convince TCR and the state and federal officials of that. The process of drafting an environmental impact statement will require TCR to respond to concerns including social and cultural impacts. The process has been extended to Jan. 9. First Ward residents are asking that the railway administration schedule a public meeting in Houston. That sounds sensible to me. Give everyone who would be affected the chance to have their say. Strangely enough, in the end it was not very contentious. Houston City Council on Wednesday voted 14-3 to allow greater single-family home density outside Loop 610, while also strengthening the proposal’s already robust protections for neighborhoods concerned about unwelcome development. Council voted to drop the threshold of support needed to impose a minimum lot size in an area – preventing the subdividing of lots for townhomes – from 60 percent to 55 percent, and agreed to phase in the new rules, keeping new development out of residential areas for two years. Mayor Annise Parker, who has said the changes will spur redevelopment of blighted areas and lower housing prices in the city, praised the first fundamental changes to the city’s development rules in 14 years. Parker said she will engage a group of home-builders and civic leaders to continue the dialogue that allowed the package to come to a vote as related reforms move forward. Neighborhood support largely was won through city promises to improve standards in regulations outside the development code, known as Chapter 42. In the ordinance itself, the Super Neighborhood Alliance got its phase-in of the new rules. The alliance raised concerns about eyesore Dumpsters at townhome developments; developers now must show where large garbage bins will sit when seeking permits. The alliance also worried about structures being built on property lines, leaving inches between homes; builders now must get written agreement from neighbors to come inside 3 feet. There are still more things that the neighborhoods wanted, having to do with things like stricter drainage requirements and Complete Streets. Houston Politics goes into some detail on that. On drainage, Councilman Stephen Costello has worked with engineering colleagues to draft reforms. Today, developers are not required to add detention when developing tracts of less than 15,000 square feet as long as they do not make more than 75 percent of the site impervious. Costello’s proposal would drop that to 50 percent, a number he said is supported by data collected as part of the Rebuild Houston program. His proposal also would make developers add detention when they redevelop a dormant site in a way that makes water run off more quickly, something current rules do not address. The references letter is here. Jane Cahill West was quoted at the end of the story saying that “overall, we’re happy” and that working together on this was beneficial for all. The three No votes were CMs Jerry Davis, Andrew Burks, and of course Helena Brown, who tried but failed to pass an amendment that would have exempted District A from the new Chapter 42 rules. Texas Leftist has more. Actually, today is almost certainly the day that the Chapter 42 revisions get tagged by multiple members of Council, thus pushing it back for a week. Nonetheless, this is the beginning of the end of a long, long journey. Here’s another story about what that will mean. The Fourth Ward would not look quite the way it does now, however, if not for a change in city development rules in 1999. That change hiked the density allowed in single-family housing construction inside Loop 610, allowing the building of several homes on what had been one residential lot. City Council is poised Wednesday to extend that Inner Loop home density citywide in the first rewrite of Houston’s development rules, known as Chapter 42, in 14 years. And that has [Ray] Washington and other south Houston civic leaders on edge. “You’ve got different developers. Some are going to be good, and you’re going to get a few bad ones. Our goal is to upgrade this community,” said Homer Clark, president of south Houston’s Five Corners Management District. To address concerns about incompatible development, the proposed rules include protections that would allow neighborhoods to impose minimum lot sizes for up to 500 homes at a time, preventing the subdivision of lots for townhomes. The requirement, which would last 40 years, also would restrict any residential or vacant land to single-family homes, keeping out apartment towers and condominiums. The minimum lot size process has existed since 2001, and is applied only on a block-by-block basis. Under the proposed change, 10 percent of property owners in an area must apply, triggering a balloting process through which 60 percent of owners must vote yes to impose the restriction. City staff could revise an area’s boundaries to secure the necessary support. 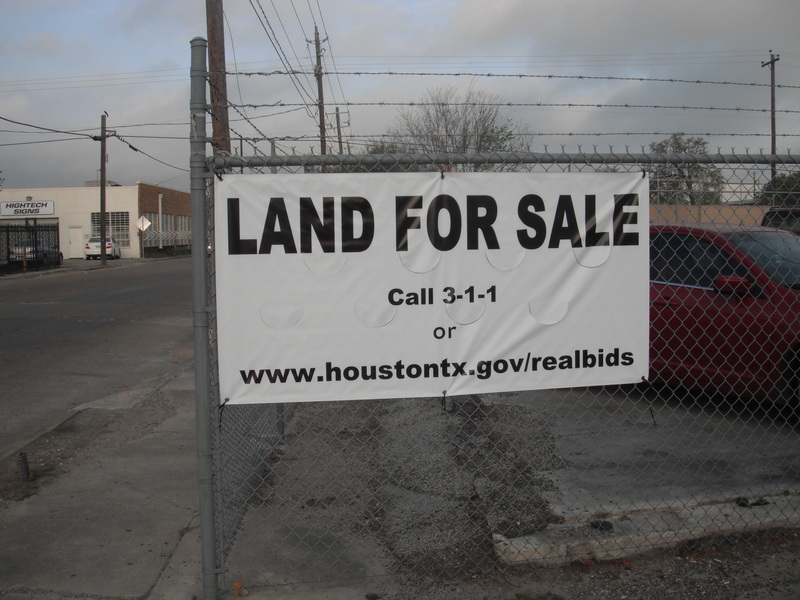 The proposal is an acknowledgement that deed restrictions are difficult to amend, said Joshua Sanders, executive director of Houstonians for Responsible Growth, a nonprofit that represents developers. “We understand the neighborhood concerns, and we think there should be more tools made available to them to protect against any sort of development,” he said. The lot-size proposal is a “huge achievement,” said Jane West of the Super Neighborhood Alliance, though she is concerned areas with many rental properties will struggle with the petition process. 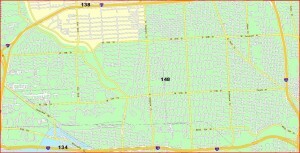 That concern led civic leaders to negotiate a phase-in: one year to give neighborhoods time to petition, and a second year during which the new density would be allowed only on tracts larger than an acre; smaller tracts could be developed if most surrounding properties are not residential. See here, here, here, and here for the recent history. This ordinance and the effort to revamp it are big, complex beasts with lots of moving parts and no one really knows what the effect of this or that change will be, but it sounds like the lot size part of it is being well received by all. If both Jane Cahill West and Joshua Sanders think it’s a good idea, that’s saying something. I think that I can speak for the SNA when I say that everyone agrees that the City needs to grow and densify, but there are good ways to grow and bad ways. Tomaro Bell, president of the Super Neighborhood Alliance (SNA), and Jane Cahill West, its Vice President, have experienced the negative aspects of Chapter 42 inside Loop 610 where it has been the law for over 10 years. They and others inside the Loop decided that the rules need to be cleaned up before subjecting the entire City to them. SN 22, along the Washington Avenue corridor, has been a test case for a lot of these issues. Jane gave a tour for City Council members and SN leaders in her area of problems created by Chapter 42 and although many have been addressed by the City, some of the more important ones still need attention. We had been told by the Mayor and developers that the main thrust for Chapter 42 was to redevelop run-down apartments and strip centers, but no sooner had the SNA removed its objections, then the Mayor started backpedaling – offering to reduce the wait time for neighborhoods to establish minimum lot sizes and setbacks from 2 years for lots under an acre to 1 year for lots under 1/2 acre. Small lots like this are not run-down apartment complexes. They are neighborhoods like yours. Under street infrastructure for most of Houston is old and antiquated, so we want to be sure that high density building does not occur where the streets have inadequate storm sewers, water lines, and sanitation sewers. When the toilet flushes next door, will you get scalded? But Jane pointed out that high density also makes every detail more important. Where are trash cans stored? Where are mailboxes? Air conditioners? With a requirement of one guest parking spot for every 6 homes, where do guests (and homeowners) really park? In Cottage Grove, emergency vehicles cannot access many homes because too many vehicles are parked on narrow streets. Ladder trucks needed for the 3 or 4 story buildings need a place for the support pads so they don’t topple over. These were Fire Marshall concerns, too, not just Jane’s. Average lot size can be as low as 1400 square feet, but there is no minimum lot size. Permeable ground can be no less than 150 square feet on a 3500 square foot lot – tiny. Chapter 42 and Chapter 9 are not harmonized; i.e., they contradict one another. Chapter 42 requires green space which increases as the lot sizes reduce until at 1400 square feet 600 square feet of green space is required, but there is no minimum lot size . Very dense development makes sense in areas that have good mass transit because then people can do without a car, but multiple small shared driveway developments scattered throughout a neighborhood would be messy and would remove the trees and shade that redefine its character. That doesn’t matter to somebody who only wants to make money, but it does matter to the people who’ve searched for the perfect house for their family. There’s a lot more to what Ed has to say, so go read the whole thing. Just as the changes from 1999 are being revisited now, the key to making this work as best as possible is to be willing to go back and make further tweaks and revisions as issues and problems arise. This is an ongoing concern, it’s not something you can do and be done with. If we see that something isn’t working the way we though it would, let’s not wait another 14 years to fix it. Here’s a look at how commuter rail along 290 might work. Commuter trains from Hempstead to Houston could start running by 2019 if the Gulf Coast Rail District can secure $300 million and if Union Pacific Railroad lets passenger cars use its track along Hempstead Highway. It would be the Houston area’s first commuter rail service between cities in at least 50 years and would help ease severe traffic congestion on U.S. 290, a major route for rapidly growing northwest Harris County. At the outset, the service would operate only between Hempstead and Loop 610 near Northwest Mall. From there, express buses would carry passengers to four employment centers – downtown, the Texas Medical Center, Greenway Plaza and the Galleria/Uptown area. To succeed, however, the project must extend the track from the loop into downtown, according to a report on a year-long study by Klotz Associates and TranSystems. Commissioned by the rail district, the report was presented Tuesday to the board. The study was commissioned last March. All of the documents related to the Hempstead rail project can be found here. The initial presentation was made last November. The report that was given to the GCRD this week is here. Of interest is that one of its operating assumptions is that the METRO Solutions Phase II plan has been “Fully Implemented” by the projected start date of 2019. It’s not clear to me if this includes the Uptown Line, which would conveniently have an endpoint at or near the Northwest Mall, which is given as one of the possible terminal locations for the Hempstead line. There is a slide with the title “Interim Terminal Bus Needs (Peak)”, which says two buses to the Galleria/Uptown area would be needed, so presumably at least at the outset the Uptown Line is not assumed to be in the mix. By 2035, the time reference used in the Houston-Galveston Area Council’s, regional transportation plan, the commuter service would see about 6,000 daily boardings without an extension to downtown. If the track is extended, ridership is expected to jump to as many as 22,578 daily boardings by 2035. I will note that the Super Neighborhood 22 comprehensive transportation plan explicitly discusses a commuter rail connection from Northwest Mall into downtown, so there is a basis for planning that extension. I’m sure the SN22 folks will be happy to talk to the GCRD about how this can be made to happen, with maybe a few of their other ideas thrown in for good measure. 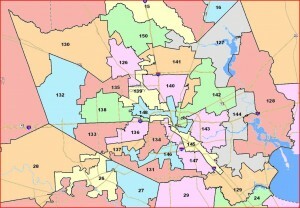 By a vote of 11 to 5, the House Redistricting Committee approved a plan redrawing the Texas House map that, according to its sponsor, committee chairman Burt Solomons, R-Carrollton, creates a total of 30 minority opportunity districts. The committee rejected several amendments offered by the four Democrats on the committee, who contended that the Solomons plan, House Bill 150, does not properly reflect the growth in the state’s Latino population during the past decade. Latino growth made up 65 percent of the 4.3 million overall population increase in Texas since 2000. “The plan passed out of committee today splits communities of interest and denies proper representation to people of color – but particularly Hispanics – who drove the population growth in Texas for the past decade,” said state Rep. Robert Alonzo, a Democratic member of the committee from Dallas. In addition to the four Democrats on the committee, state Rep. Harvey Hilderbran, R-Kerrville, voted against the bill. State Rep. Carol Alvarado, D-Houston, one of the four, objected to the speed with which the Solomons plan was adopted. She said the fast track didn’t allow the committee time to consider the changes made to the bill during today’s committee meeting. She also opposed reducing Harris County districts from 25 to 24, ostensibly because the county’s population growth was not enough to warrant a 25th seat. Alvarado argued that the county grew by 20.3 percent from 2000 to 2010, a rate that’s close to the 20.7 percent growth from 1990 to 2000 that justified a map with 25 districts. The difference between the two is pretty jarring. The fact that the only opportunity to give feedback to the committee was last weekend makes it all the worse. Say what you want about the Houston City Council map, at least you had a chance to be heard. You can see a PDF of the map here. On the plus side, the weirdly uterus-shaped district in and around Williamson County has been replaced by something that doesn’t appear to have been drawn by a prankster. Beyond that, I don’t have much good to say. State Representative Carol Alvarado’s Statement on the committee vote and passage on the committee substitute of HB 150 as amended, the redistricting map for the Texas House of Representatives. 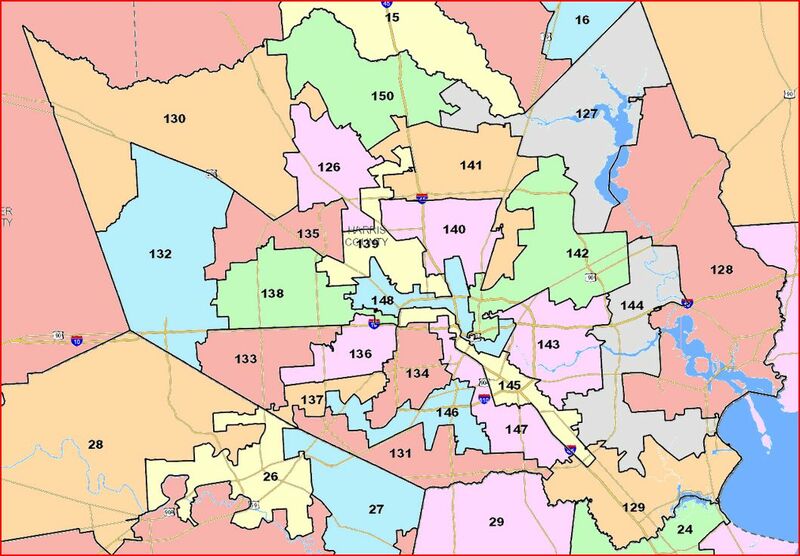 “The map that was voted out of the Redistricting Committee is bad for Harris County. I stand by my “no” vote on this proposed plan as it would cause Harris County to lose representation by merging two predominately minority districts. Center Street recycling center for sale? Looks to be that way. Back in 2009, the city contemplated selling the site to Admiral Linen next door, and opening a new recycling center on Spring Street in the First Ward. See here, here, and here for background. The move was opposed by First Ward residents on the grounds that the area was becoming too residential for such a facility, and Super Neighborhood 22 residents, who wanted the city to consider other options for the Center Street site such as a city-owned parking lot. I presume this has come up now because the city will need revenue to close a large budget shortfall for the next fiscal year. Arguably, with the success of the single stream recycling program, this center isn’t needed as much any more. I know I haven’t been there since we got our big wheely bin and could get glass and cardboard picked up along with everything else. I don’t know anything more about this beyond the fact that I spotted that sign on the site the other day, so I’m just throwing this out there. Anyone else know something about this? Anyone who’s been watching Washington Avenue has seen this. From downtown through midtown and along Washington Avenue, a population growth spurt has taken off since 2000. One buzz word to describe what’s going on is “infill,” said Jerry Wood, previously Houston’s deputy assistant director for planning and development and now an independent consultant advising the city on census issues. Wood said that infill, or the use of vacant land in an otherwise built-up area, has happened in such neighborhoods as Rice Military (between Westcott and Shepherd south of Washington), First Ward (near Houston Avenue north of Washington) and Cottage Grove (both sides of Interstate 10, between Shepherd and Hempstead Highway). “In Cottage Grove, three-and four-story townhouses are replacing bungalows at a high rate,” Wood said. “That’s been true throughout that ZIP code. They’re also replacing a lot of empty lots and vacant buildings. The growth in that part of town is astonishing, and for the most part good. The main downside, as noted in the story, is that the infrastructure has not come close to keeping up. Most of the streets parallel to Washington are very narrow, with no sidewalks and drainage ditches. Parking is a big problem, and there’s often no room for cars driving in opposite directions to get past each other. (Yes, this includes all of the streets around the Wal-Mart site.) The area desperately needs a comprehensive transportation solution to help deal with this. 77010 is a tiny area, just a few blocks, on the east side of downtown; Google Maps centers it on Discovery Green, which says to me that the population growth there is likely the result of the One Park Place tower. 77002 is the rest of downtown and a little bit of midtown; if you picture the area in the middle of the Loop that’s bounded by 45, 59, I-10, that’s more or less 77002. 77007 is basically Super Neighborhood 22, which is the main focus of the story. 77019 is River Oaks/north Montrose and most of Midtown, and which includes Estates at Memorial, while 77098 includes 2727 Kirby. Finally, 77003 is EaDo and the Harrisburg area, which I’ll bet shows double digit growth in the next Census as well. What’s truly curious to me is the two ZIP codes that show negative growth. 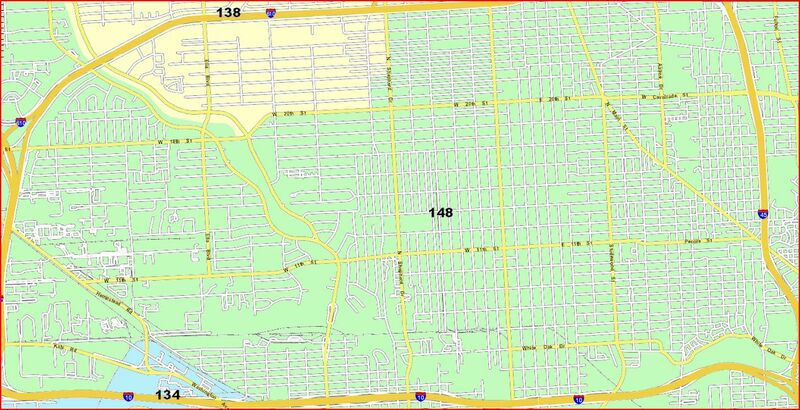 77009 is all of the Heights plus a roughly equivalent area east of I-45, which includes places like the Near Northside and Lindale Park. I’ll admit to not being as familiar with the eastern half of the area as the western part, but I cannot fathom it losing over four thousand people this decade. I see fewer vacant lots, not more, and the gentrification of the Heights has brought a little baby boom with it. 77018 is more or less Garden Oaks/Oak Forest, and while its loss is smaller, I don’t understand it, either. The increase in white population is easy to believe, as is the increase in Asians. It’s the decline in the Hispanic population that’s strange. You can see a graphic representation of this for the whole county at Greg’s place. Obviously, some of the Latino growth in the burbs is fueled by inner city folks moving outward in search of affordable houses and better schools. I have to wonder if some of it is also due to insufficient participation in the Census. All I can say is that I just don’t believe 77009 lost ten percent of its people. I hope a review of the Census process leads to an adjustment of these numbers. 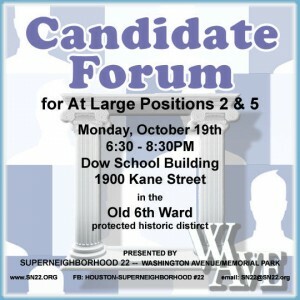 (Houston) – On Monday evening, September 13, 2010, the Washington Avenue-Memorial Park Super Neighborhood (SN 22) will host a public forum and panel discussion titled: Opportunities and Incentives for Retail Development in the Urban Core. This event will be held in lieu of SN 22’s regular monthly meeting from 6:00-8:00 p.m. at the Council on Alcohol and Drugs – Houston, 303 Jackson Hill, Houston, Texas 77007. Mayor Parker has recently hosted two public meetings to address the Ainbinder Company’s plans to develop a retail center on Yale Street at Koehler anchored by a 24-hour Walmart Supercenter, and the city’s intent to facilitate the development by providing the Ainbinder Company a “380 Agreement.” The “380 Agreement” would allow the city to use tax revenues generated by the development to reimburse the Ainbinder Company for improvements to public infrastructure. The first public meeting was held on August 25th, and the second public meeting was held on September 1st. Mayor Parker expects to bring the proposed “380 Agreement” to City Council for a vote next week. Walmart’s plans for the Supercenter and the Ainbinder Company’s plans for infrastructure improvements are also available at a website established by Ainbinder Company: http://www.washingtonheightsdistrict.com. 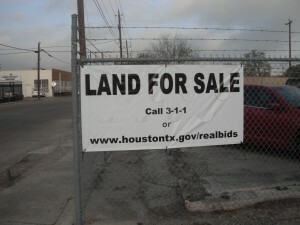 Community opposition to these plans and to the city’s intent to enter a “380 Agreement” with Ainbinder Company is being organized by a recently created non-profit organization, Responsible Urban Development for Houston (RUD): http://www.stopheightswalmart.org. Where SN 22 is located: SN 22 extends from the western edge of downtown on the east to Loop 610 on the west. Buffalo and White Oak Bayous create the north and south boundaries of the SN 22 group of neighborhoods: Camp Logan, Cottage Grove, Crestwood/Glen Cove, First Ward, Magnolia Grove, Memorial-Heights, Rice Military, Sixth Ward, West End, and Woodcrest. Wal-Mart has bought a tract of land near the Heights. The store would be part of a larger development just south of Interstate 10 near the northwest intersection of Yale and Center. A development site plan obtained by the Houston Chronicle shows a 152,015-square-foot Walmart flanked by a parking lot for 664 cars and additional retail spaces for a bank, fast-food restaurant and other stores. Retail sources said the new Walmart likely would be one of the chain’s Supercenters, which average 185,000 square feet and combine full grocery and general merchandise, according to the company’s website. In addition to serving residents in the Heights and other surrounding neighborhoods, the new store would seek customers from a growing population around the Washington Avenue corridor. Swamplot and Prime Property have more on this. Here’s the question I have: How are people going to get to this place? 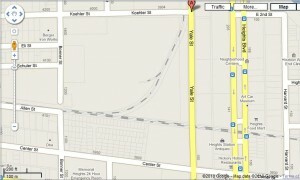 Here’s a link to that Google map; click the thumbnail for a larger image. The only real access to this site will be via Yale. The freight train tracks to the south completely cut off traffic except at Heights, Yale, and Patterson off to the west. Note that Bonner, the west end of this site, dead ends at the tracks. You can’t walk there from Heights Blvd except from Center. 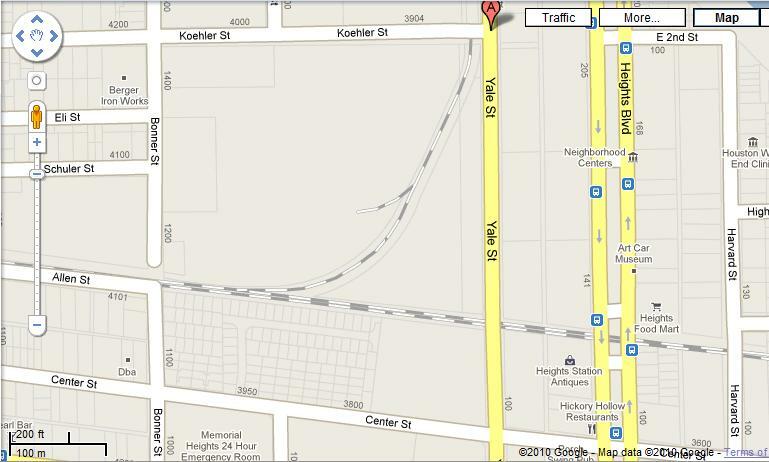 Koehler, to the north, only connects at Patterson. How are people going to get there? You could, I suppose, connect the two pieces of Bonner, which would help. (Would the developer pay for that, I wonder?) You could also connect Bonner and maybe Bass Court to the eventual I-10 service road extension that will link Durham/Shepherd to Watson/Sawyer. (Note that as of today, you can only access Yale from I-10 on the westbound side.) I don’t know what the timeline is on any of these things, nor do I know if such connections are part of TxDOT’s plan. I do know that if you’re depending on Center Street to move traffic, I’d be worried. Center is a narrow little road on which traffic flow can be impeded by someone parking, and it’s used by a lot of trucks because of the various industrial sites that remain in the area. I figure the developers have a plan for all this, I just can’t quite picture it myself. Finally, I have to wonder what the Super Neighborhood 22 folks think of this. It doesn’t seem to fit in with their vision for the Washington corridor. I’m getting an Ashby Highrise feeling about this. Typically, there’s already a Stop Heights Wal-Mart Facebook page. I don’t much care for Wal-Mart and don’t foresee myself shopping there – our Costco membership and the Target on Sawyer meet our needs quite nicely, thanks – but it doesn’t offend me that they’re looking at this parcel. I just don’t see how they’re going to make it work. No question that there’s a crying need for a grocery store around there. If the Wal-Mart in question includes groceries, that may ameliorate the complaints somewhat. But the questions about how do you get there from here would remain had H-E-B won the bid. Marty Hajovsky and Nancy Sarnoff have more. Some big things may be coming to Washington Avenue. Super Neighborhood 22 — a council of civic clubs in the Washington Ave. corridor — will hold a meeting May 24 to discuss its proposed master plan for transportation in the area. To deal with increasing development, density and congestion, the neighborhood envisions a streetcar on Washington Ave. to move pedestrians and a trench near Center Street capable of carrying four freight or commuter rail lines, allowing traffic to pass uninterrupted overhead. The neighborhood’s meeting is scheduled for at 6:30 p.m. at DePelchin Children’s Center, 4950 Memorial Drive. The super neighborhood, one of 88 such groups in the city, covers the space between Buffalo and White Oaks bayous and between the West Loop and Interstate 45. Super neighborhood president Jane West and vice president Tom Dornbusch said the meeting aims to gather input from community members in hopes of building a consensus around the plan, giving it more weight with policymakers. “We’re trying to get ahead of the game, instead of letting all these other entities decide where the best place is to put transit through our corridor,” West said. “We’re trying to decide where and how that transit should be directed.” West and Dornbusch both cited Harris County’s plans for commuter rail along U.S. 290 as a reason for action. Many of those commuters work downtown, West said, and must pass through Washington Ave. to get there. “Super Neighborhood 22 is in the direct path of that route,” Dornbusch said. I highly recommend you take a look at their detailed presentation of the various options. I got a much better idea of what they had in mind after looking at it. I was all set to write something about how I didn’t like the idea of streetcars on Washington Avenue because that seemed like giving up on the idea of an Inner Katy light rail line, but they’ve got it more than covered. I love the trenching plan for freight and commuter rail lines, and the streetcar network they envision to complement it makes a lot of sense. There’s more, too – sidewalks, hike and bike trails, and so forth. Give it a look, and attend the meeting on Monday if you can. You may recall that the city had proposed selling the neighborhood recycling center on Center Street to the Admiral Linen business next door, and that this move was opposed by residents in the area. The city is still considering this possibility, and the residents are still opposing it. Harold Hayes, director of the city’s Solid Waste Department, said last week the department hasn’t shelved plans to sell the property at 3602 Center St. The city’s real estate division is searching for an alternate location for the recycling center, he said. City Councilman Ed Gonzalez, who represents the area, said Mayor Bill White intends to pursue the offer from Admiral Linen. He said he will host community meetings in the coming weeks to discuss the issue. “It hasn’t been resolved where to relocate. I think that needs to be worked out. Should we sell the property, number one, and number two is, what’s the timetable to have an alternative plan? That’s where it is right now,” Gonzalez said. Members of the Super Neighborhood coalition think the city should keep the Center Street property, lease part of it to Admiral Linen, then use the proceeds to develop a parking garage on the site which could help solve parking problems associated with the growing entertainment scene just blocks away on Washington Avenue, West said. I don’t necessarily have a problem with the idea of selling this location, if there’s a good alternate location in hand and the city gets a good price for it. But there isn’t an identified alternative yet, and West is correct that this isn’t such a good time to be selling prime property like that. Surely the city would fetch a much better price for the place in another year or so, by which time there may be a viable alternative that folks can live with. In the meantime, I think it’s worth exploring the option the Super Neighborhood folks have proposed, which might just give everyone at least some of what they want. According to the email I got on this, CM Melissa Noriega will also be present. – CM Jolanda Jones has had some issues with the Houston Professional Firefighters Association, but as Mary Benton notes, not all firefighters’ groups are against her. The Houston Black Firefighters Association has endorsed City Council Member Jolanda “Jo” Jones in her campaign for re-election to Houston City Council, At-Large Position 5. “Firefighters are my heroes,” said Jones. “I’ve ridden with them for 24-hour shifts, and understand more than most, that they have a grueling unrelenting job that goes way beyond the heroic task of rescuing us from fires. And that’s just one of the reasons why I am working so hard to implement solutions that will end discrimination and improve working conditions for all firefighters – because their jobs are hard enough. This week’s meeting allowed our membership to endorse a couple more positions. Alma A. Allen, Carol Alvarado, Ellen Cohen, Garnet F. Coleman, Harold V. Dutton, Jr., Jessica Farrar, Ana E. Hernandez, Scott Hochberg, Kristi Thibaut, Senfronia Thompson, Sylvester Turner, Hubert Vo and Armando Walle. Olivo will have a contested primary for the third straight cycle, so that’s where this is coming from. – I noted recently that Bill White had received several more endorsements from State Reps in his bid for the Senate. I mentioned that he had the support of all of the Harris County Democratic reps except for Senfronia Thompson, Al Edwards, and Kristi Thibaut. In the comments to that post, Keir Murray said that Rep. Thibaut has in fact endorsed White. Note to Team Bill: Update your list. – Meanwhile, John Sharp collected endorsements from State Reps. Allen Vaught and Kirk England, both from the Dallas area. I don’t know exactly how many such endorsements Sharp has received, but I’d bet White has a decent lead in that department. – And speaking of scoreboards, BOR has a more detailed look at White’s fundraising and cash-on-hand numbers. I can’t wait to see what Sharp did this quarter – it has to be better than the last quarter, but that ain’t saying much. BOR also has a peek at numbers from CD10, where Jack McDonald is going strong in his bid to unseat Rep. Mike McCaul; CD21, where, um, not much is happening; and CD17, where Rep. Chet Edwards has the usual target on his back and the usual stellar fundraising report. Check ’em out. Apparently, Orlando Sanchez, our do-nothing County Treasurer, is a closet urbanist. I’ll direct you to Greg for a thorough review of Sanchez’s vision for Washington Avenue, to which there’s not much to add. I will note that Sanchez continues to be two-faced about light rail, and that he managed to write this entire piece without mentioning that there’s a pretty active Super Neighborhood group that’s been thinking about this sort of thing for (I daresay) a lot longer than he has. (And not to toot my own horn, but some of us have been thinking about the light rail possibilities in that corridor for awhile, too.) But at least now we know he’s done something other than play Solitaire during his time in office. ** Spotts Park will feature live music and performances by MECA, a Children’s Spott with special interactions, and the Eco-Fair, with Go Green reps from city departments, plus a host of green community organizations. Click on to see the flyers for more details.